There are a few places that I go where my stomach drops and I feel my heart tighten up from the feeling of knowing the despair and heartache that was felt by people at some point. The places that I have distinctly felt this feeling are at the Gettysburg Battlefield, the Flight 93 Memorial, and in Johnstown at the sites of the sheer devastation from the floods. Today we take a look at Johnstown at night, a beautiful place and a place that represents the redemption of the human spirit in the wake of disaster. Here is the Inclined Plane, the steepest vehicular incline in the world. It was built right after the disastrous 1889 Johnstown Flood, to help people escape quickly in the case of another disaster. The building of it also resulted in a building boom at the top of the gorge. They have created a small parklet at the confluence of the Little Conemaugh and Stonycreek Rivers, in the spot where the worst devastation occurred from the 1889 Flood. It is humbling and horrifying to think of the sheer devastation that occurred here. In light of the devastation and due to an outpouring of generosity from the entire country, including Clara Barton and her American Red Cross, an organization that goes and helps out in the case of human tragedy, the town was able to recover and heal. The sheer scale of this disaster is difficult to imagine. 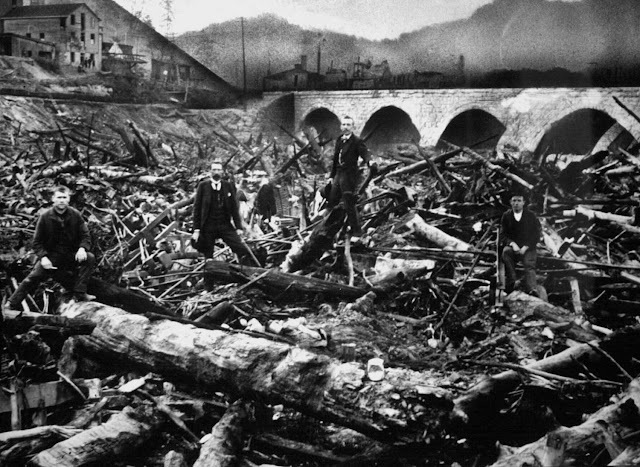 2,209 lives were lost as a result of the dam breaking at South Fork and the lake pouring through the Conemaugh Gorge. This Leave a Note of Hope public art project is located right in this spot. This location and the bridge represents the hope and resilience of the people of Johnstown and this entire nation. The Stone Bridge was ground zero for the flood of 1889. So much of the debris from along the miles long path of destruction ended up getting trapped at the bridge, with the bridge forming an dam. The wreckage that gathered at the dam caught fire and ended up burning for three days, with hopeless and countless victims being caught within that wreckage. They were never able to identify all of the victims, a desperately unthinkable situation. They brilliantly lit this bridge in LED lighting in 2008. It looks absolutely stunning. The bridge is still utilized on the old Pennsylvania Railroad Main Line and current Norfolk Southern Pittsburgh Main Line. Located in this park area is Johnstown's Eternal Flame, in memory of the horrific disaster. I highly recommend touring the Johnstown area. The heritage of this unnecessary tragedy of epic proportions taught us so much about how to handle future disaster situations. A silver lining to this horrendous catastrophe landed us with a stronger American Red Cross, an organization that has helped millions of people caught in disasters ever since. Johnstown is well worth a visit for its beauty and heritage.